Growing up holidays were always a pretty big deal. I’m 3/4 Italian. My dad was Italian on both sides and my Mom was 1/2 Italian (her mom was Italian and her dad was English)..but lets face it 90% of the traditions she has are italian as her grandma also lived with them most of her life. My great-grandparents were never divorced but lived separately for MANY years…my grandmother was very Catholic and was of a generation that didn’t believe in divorce. Every Christmas for as long as I remember we’ve made the same things. Italian Cookies, Butter Cookies, and homemade Raviolis. And every year when we make them we tell stories of how my grandmother and great grandmother used to make them differently. Several years ago my Aunt made everyone a binder of all my great-grandmother’s christmas recipes we use it every year. This year was no different. 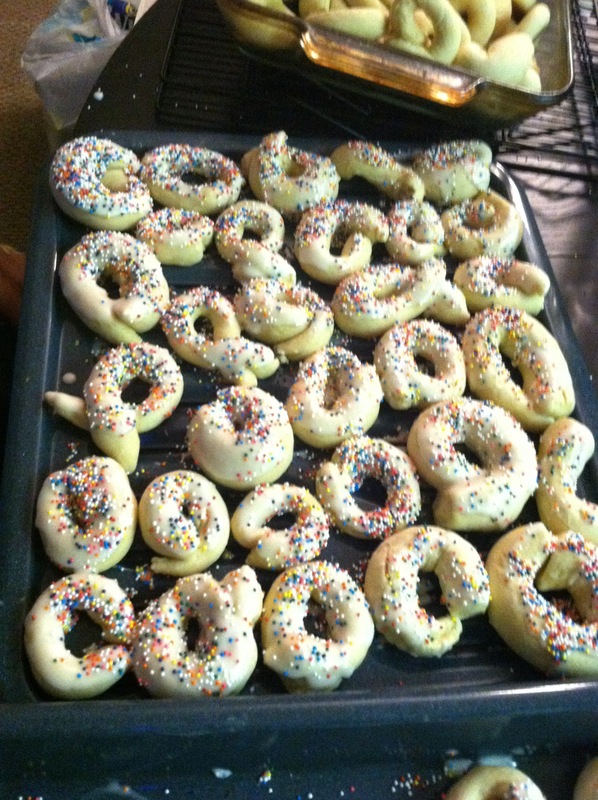 We made Italian Cookies. and as my mom iced them we joked about the way my great grandmother used to take a knife and individually ice each cookie…and we are way too impatient for that and just dunk the cookies into the icing (it’s a very thin icing). ?Some years we went to NY to visit relatives and my cousins and I would make the cookies together. 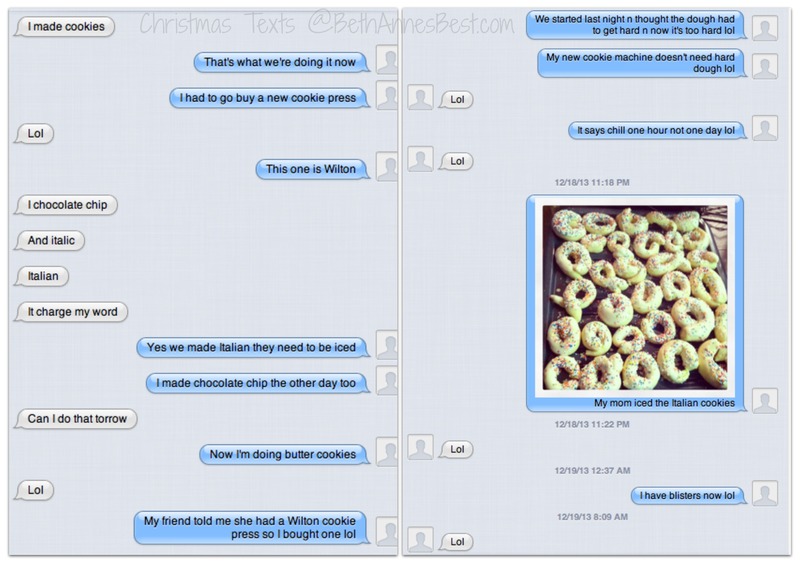 This year we exchanged text messages and photos of our cookies.? 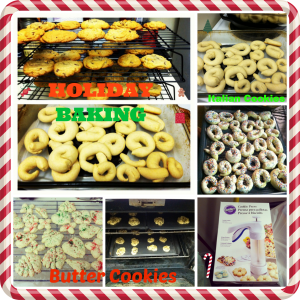 All of our cookies:? The way we make Ravioli’s has changed since my great-grandmother’s time. 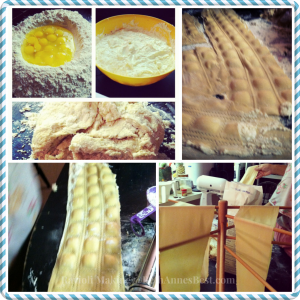 She used to use nothing but a rolling pin and a pasta board….yeah we tried that once and didn’t get very far….we now use the pasta attachments for the Kitchenaid (and let me tell you what used to be an all day affair is now done in less than 2 hours) and this year we added the ravioli attachment. I haven’t decided how I like that attachment yet… Christmas Eve was also a pretty big deal. 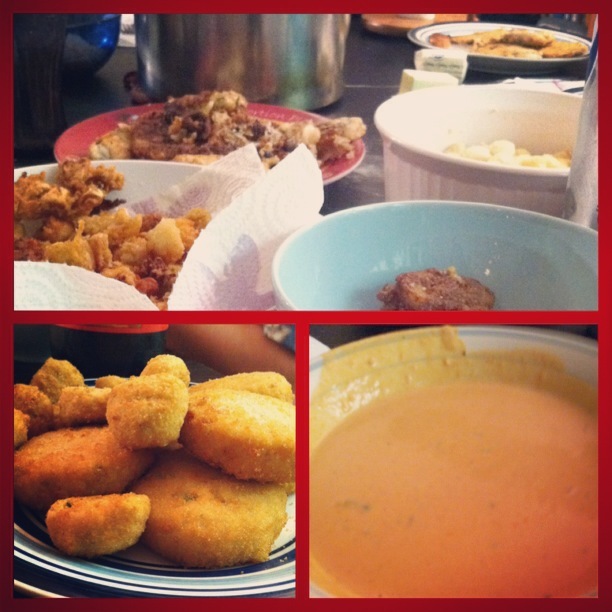 We always celebrated the Feast of the Seven Fishes. I honestly never knew where this tradition came from. I just knew you either had 7 fish dishes to represent the 7 sacraments or 12 for the 12 disciples. However this year I decided to google about the feast and I found this website. And according to tradition back in the day Christmas Eve used to be a penitential day (similar to Good Friday) and many Italian Catholics didn’t eat meat until after they received communion at Midnight Mass on Christmas Eve.? I shared the article with my mom and this is what she had to say,? One thing I have learned over the years is no matter how old I get and whether we have dinner for 3 or dinner for 30 on Christmas Day the traditions are very important to me. It’s weird to have Christmas and not do any baking…even if we only make one batch of cookies. Every year we tell the same stories about how things used to be and how Grandma and Great-Grandma did things differently and laugh at their crazy stories. It’s a fun way to spend time together and I wouldn’t have the holidays any other way. ?